ECB President Mario Draghi. Image © Giulia Carbonaro/ European Central Bank 2019. The Euro dropped after the European Central Bank (ECB) announced it would be making billions of Euros available to Eurozone banks at cheap rates to try and reinvigorate lending to the economy. The provision of cheap funds are done via Targeted Longer-term Refinancing Operations (TLTROs), this is an ECB operation that provides financing to credit institutions for periods of up to four years. Following its March meeting, the ECB announced it would start a third TLTRO programme in September: markets were expecting some details on such a move and hence why an initial slip in the Euro on the announcement has more-or-less been reversed. The tranches will start in September 2019 and end in March 2021, with each loan having a maturity of two years. The interest rate on the loans is less favourable than under TLTRO-II as it is indexed to the refi rate over the life of the operation. Under the current programme it is fixed and as low as the deposit rate. More details will be communicated by the ECB in ‘due course’. "The early announcement of the TLTRO is a positive, but the new programme will be under less favourable terms," notes Nick Kounis, an economist with ABN AMRO. "The ECB is now clearly reacting to the slowdown in economic growth and the weaker outlook for inflation. However, this does not represent fresh monetary stimulus, but rather a very long postponement of policy normalisation. 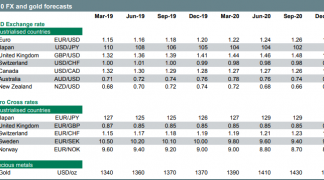 Our base case is that policy rates will remain on hold until December 2020." Also of note, the ECB said interest rates are to stay on hold at least through the end of 2019, which effectively rules out a 2019 hike. "We now expect the key interest rates to remain at their present levels at least through the end of 2019, and in any case for as long as necessary to ensure the continued sustained convergence of inflation to our objective," ECB President Mario Draghi told a press conference following the decision. "In a dark room you move with tiny steps. You don’t run but you do move," added the ECB President. "Markets had pretty much priced this in - but the curve will flatten and the Euro will be held down. Dovish Draghi strikes again!" says Viraj Patel, a foreign exchange strategist with Arkera. The Euro-to-Dollar exchange rate has fallen half a percent in the wake of the announcement with 1 EUR buying 1.1251 USD at the time of this article's update. The Euro had been stronger for much of the day a broad weaker Sterling, but the pressure on the single-currency has now seen the gains reversed and the Euro-to-Pound exchange rate drop from a day high at 0.8624 to the currently quoted 0.8575. 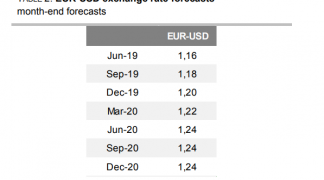 Also driving a weaker Euro are downgrades to the ECB's growth and inflation forecasts which appear to have been reduced more than markets had expected. The ECB cut its inflation forecasts, 2019 inflation is seen at 1.2% vs. 1.6% forecast in December 2018. "While there are signs that some of the idiosyncratic domestic factors dampening growth are starting to fade, the weakening in economic data points to a sizeable moderation in the pace of the economic expansion that will extend into the current year," Draghi told journalists. The ECB sees 2020 inflation at 1.5% vs. the 1.7% forecast in December. 2021 inflation is now forecast at 1.6% against the 1.8% seen in December. "Underlying inflation continues to be muted. The weaker economic momentum is slowing the adjustment of inflation towards our aim," says Draghi. The ECB meanwhile revealed the biggest cut to its economic outlook since the advent of its quantitative-easing programme in early 2015. The ECB expects 1.1% GDP growth this year, whereas in December it forecast growth of 1.7%. 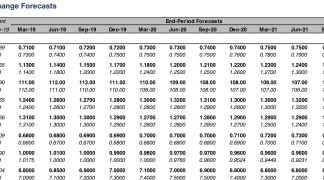 The 2020 forecast is dropped from 1.7% to 1.6% and the 2021 forecast remains unchanged at 1.5%. Graphic courtesy of Frederik Cucrozet. 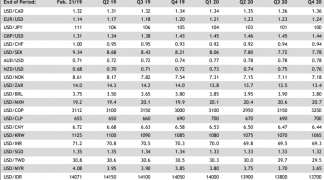 "The revisions to ECB staff projections are larger than we expected overall," says Frederik Cucrozet, Global Macro Strategist with Pictet, a Swiss multinational private bank and financial services company. Concerning the currency, analysts are telling us they expect weakness to persist on the back of today's ECB event.